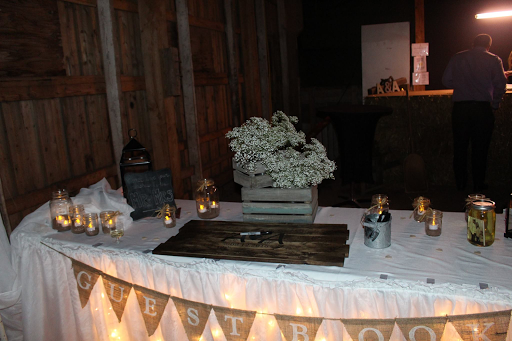 Apparently it’s common these days for the bride and groom to have a large board or sign at their wedding reception for guests to sign their names on. I’ve made a few. This one is 5 boards glued together and stained. The bride-to-be wanted the edges to be darker and uneven, so I sanded the middle section only. I then painted their initials and wedding date. They used a permanent marker for the guests to write on the board. This piece was about 30″ wide and 16″ tall. It’s a nice keepsake that the couple can hang in their house for many years to come. Tomorrow I’ll post a couple more guest books that I recently made. I enjoy working with brides, maybe you know a bride I can make something for? If you recall, I made a sign for a new local bakery and café. I was pleased with how the sign turned out except for one issue I had with it. Let me backtrack a bit. 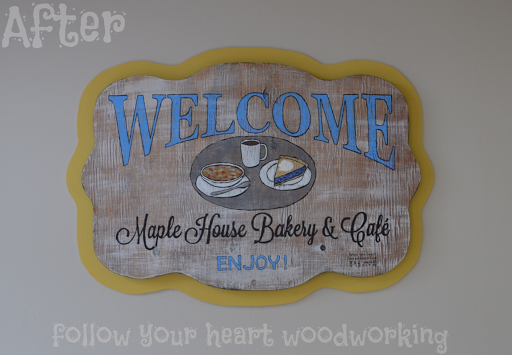 The sign was to go in the entrance of the bakery, which has yellow walls and white trim. My sign has a grey background, which I thought would show up well against the yellow. Only problem is that the entranceway doesn’t have yellow walls, it has grey walls. Something that I apparently did not realize when I made the sign. I went and removed the sign and made a backing board to fit behind it. I think it’s much better like this! I’ll post something else I made for the bakery in a few days. I have been very, very busy in my shop and without time to blog. I have made quite a few sales, thanks to the people of my town of O’Leary, and to a few island brides-to-be. This is something I whipped up after seeing some hanging fish on another cool blog called Scavenger Chic . I decided to hang mine from a sign with a last name on it so that it could be on the front of a house. The second one is with a wood stained name piece, I didn’t paint the McMaster name, it’s just superimposed on there with the magic of computers. Many people here don’t have their number on the front of their house, so maybe this will generate some sales? Now that the weather is nicer I have improved the area at the front of my shop. I bought an old bicycle which I spray painted red, and painted everything, the seat, the tires, the basket, everything! Then I used old pallet wood to make a flower box to fit in the basket. I also have a new number sign under the light by the door. And I needed a two-sided sign for outside, so I made one and attached it to a post that sits off the edge of the deck that runs across the front of the shop. This is a wood spinner, or whirlygig that I hang off my sign to attract the attention of passersby! I made it myself with thin strips of wood. I’m not sure if any of you noticed, but the wood screen door that I repaired and blogged about before here is not in any of the photos. That’s because it blew open a few weeks ago and broke. Now I need to fix it again! I bought a stack of about island barn board that is about 100 years old, last fall. The person I bought it from had taken it off an old barn nearby. Some of it is 12″ wide and many pieces still have nails in them. 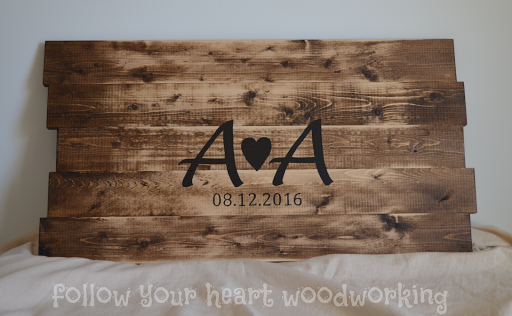 I made another one yesterday with the same wording and font, but of course every piece of wood is different, and this one is a big larger. 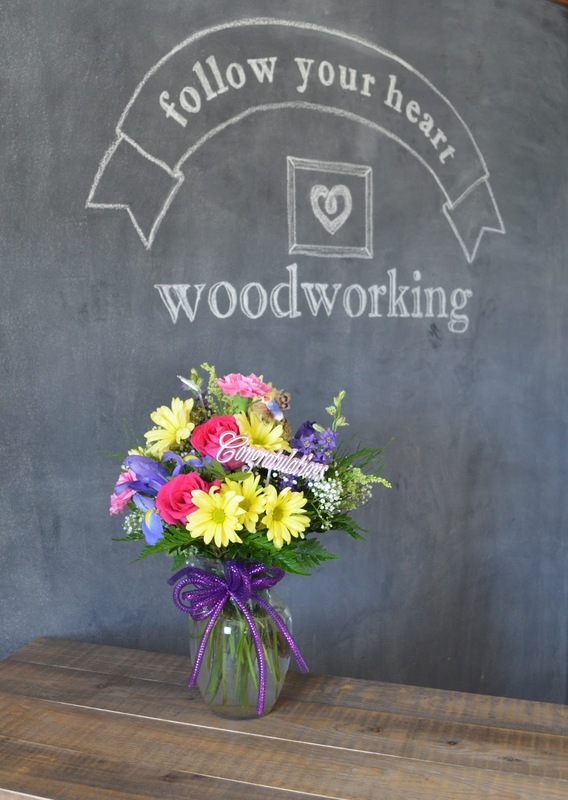 On another note, I received a lovely gift of flowers from my mother-in-law, congratulating me on the opening of my shop. It was a nice surprise… thanks Thelma! 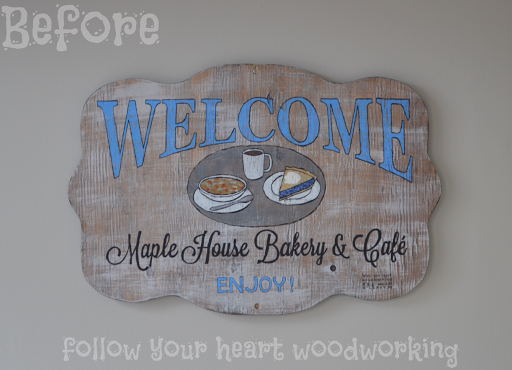 This sign is 17″ high x 13 3/4″ wide. I think I’ll make another one similar, do you have any ideas on what colours I should use? I had my first walk-in order from Eileen, who lives in a small community nearby. She wanted a sign to put in her garden and she likes barn board, script fonts and beach type décor, so this is what we came up with. She just loves it, and I do too! A few days ago was “Setting Day” on Prince Edward Island. This is the first day the fishers go out and set their lobster traps. 18 1/2″ long x 3 1/2″ wide. Distressed and available in many colours. The men and women who venture out work very hard in tough conditions. I hope they have a good and safe season.